This story originally ran as part of "The Greatest Athletes" series in the York Daily Record and on GameTimePA.com in January 2009. Bill Schmidt ( Class of 1942): He competed in just one sport, but he was the best in the nation when it came to his event. Schmidt accomplished more in high school swimming than any swimmer in York County history. Undefeated in individual competition for three years, he won three individual state championships in the 100-yard breaststroke from 1940-42. He held the national scholastic and national YMCA records for the 100 breaststroke in 1941 and ’42. He also earned another state gold medal as a member of the three-man 150-yard medley relay team as a junior. The relay team also set national scholastic and national “Y” records for two seasons despite changes in the lineup. He regularly beat teammate Bob Sohl — Class of 1944 — who went on to earn a bronze medal at the 1948 Olympics. He could also compete against the best despite trying something for the first time. Schmidt swam at AAU championships in Ann Arbor, Mich., at the end of his junior season and became the youngest swimmer to reach the finals of the 220-yard breast — placing fourth in an event he competed in for the first time. He caught a train from Michigan to Philadelphia and swam in the YMCA national championships the following day — where he placed fifth. He also defeated college swimming champions, placing second in the 220-yard breast- stroke at the National AAU Swimming Championships during his senior year. The only man to beat him was Ohio State’s James Counsilman — a future Hall of Famer who would later coach Mark Spitz at Indiana. After a three-year stint in the U.S. Coast Guard, Schmidt earned All-America honors while swimming at Temple University. He placed fifth in the 1948 U.S. Olympic Trials. He returned to William Penn as an assistant swimming coach in 1955, and he served as the head coach from 1964-78 — coaching 31 All-Americans. He died in 1998 after his morning swim at the YMCA. Harry ‘Haps’ Benfer (Class of 1911): Near the turn of the century, he did what no other York County basketball player would do for another 41 years. Standing more than 6 feet tall, he became the first county player to score 1,000 points, finishing with 1,101. No other player in the county scored 1,000 points until Hal Brown in 1952. Benfer held the school’s career scoring record until Steve Orr topped him in 1980. He scored 44 points against Bucknell Academy as a junior, only to set the single-game record as a senior — when he scored 50 points against Steelton on Jan. 6, 1911. He scored 531 points as a junior, more than twice as many points as any other teammate. The school yearbook noted his junior point total as a U.S. scholastic record. He accomplished all of this when William Penn played several prep schools and college freshman teams. That year, the school’s athletic committee awarded players with a medal and watch fob inscribed “State High School Champions” to honor the team. A starter and pivotal player on the football team for three seasons, he played left and right halfback. The football team went 3-1-2 his junior year, and William Penn did not enjoy another winning football team until 1922. He also played goalkeeper on the school’s first soccer team in 1910. Benfer attended Albright College, where he played football, basketball and baseball. At Albright, he was voted the “most outstanding” athlete of the first half of the century and inducted into the school’s hall of fame in 1993. Pierre Ritter (Class of 1972): He owns more track and field gold medals than any athlete in school history, winning five state titles. He won both the 180-yard low hurdles and the 120-yard high hurdles as a junior. He helped William Penn win an unofficial team state track title in 1971. He repeated as state champion in both hurdle events as a senior, and he added a state title in the 100-yard dash. At that time the PIAA did not allow athletes to compete in more than three events at the state meet, and the Daily Record reported that he became the first athlete in Pennsylvania to win three state championships in almost 30 years. Sports Illustrated featured him in the “Faces in the Crowd” segment on July 10, 1972, for his track accomplishments. He also came close to setting three district records his senior year. He set the record in the low hurdles with a time of 19.1 seconds, breaking a 10-year-old mark. And he beat the district mark in the high hurdles but was beaten to the tape by 0.1 seconds by Harrisburg’s Bernie Allen. His most impressive effort, however, came in the 100 — an event he attempted in only his senior season. He finished 0.1 seconds off the record set in 1937 by Lancaster’s Barney Ewell, an eventual world-record holder in the 100, a gold medal winner in the 400-meter relay and a silver medalist in the 100 and 200. On the football field Ritter was a threat to score from the running back position. Recruited by the United States Naval Academy to play football and run track, he decided against playing football, and a hamstring injury during his plebe year ended his athletic career. A police captain, Ritter has worked for the Harrisburg police for 28 years. Hal Brown (Class of 1952): He changed the way basketball was played in the county when he pioneered the use of the one-handed jump shot. Before then, most players used a two-handed set shot, rarely leaving the hardwood to score baskets. He became the second basketball player in York County to score 1,000 points, and the first since “Haps” Benfer in 1911. He won the Central Pennsylvania League scoring title in his junior (23 ppg avg.) and senior (21 ppg) seasons. He set the league’s single-game scoring record, dropping 50 points against Harrisburg’s William Penn in a 100-57 victory on March 4, 1952. He also earned three varsity letters in baseball, seeing time as a shortstop and pitcher. His baseball teams earned shares of league titles his junior and senior years. He earned a basketball scholarship to Penn State but left after one year — finishing his college career as a starting guard at San Diego State. He remained in California, where he raised his family. 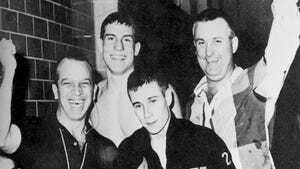 Bill Groft (Class of 1963): One of the best swimmers to come out of York County, he won six individual state gold medals and helped re-establish William Penn as the premier swimming program in the state and perhaps the nation. William Penn won the team state championship in his senior year after a four-year hiatus. He posted the top 100 freestyle time in the nation. A four-time All-American and a four-time qualifier for the state championships, he swept the 50 and 100 free events as a freshman and sophomore. He won the 100 free as a junior and placed third in the 50 free. He also won the 200 free in state-record time as a senior. He earned a swimming scholarship to Michigan and won Big Ten championships in the 50 free in 1965 and 1966. He worked as a banker after graduation. Tisen Thomas (Class of 1989): He played five different positions in football and dazzled at each one, leading his team to league titles and the district playoffs. He scored points in basketball (13 ppg as a senior) and also dominated with his defense on league title teams. He ran the sprints in track, and his 400-meter relay team set a league record (42.60 seconds) that still stands. He was a member of a 1,600 relay team that placed third in the state, and he was a member of a 400 relay team that placed second in the state. Football was his best sport, though. He played quarterback as a senior, spearheading York’s triple-option offense. He threw for 650 yards and 10 TDs, rushed for 805 yards and six TDs and returned three kicks for TDs. His big plays were bigger than any other player in the area. He took an opening kickoff 97 yards for a touchdown against CD East. He returned a punt 55 yards against South Western. And he turned a bad snap on an attempted punt into a 69-yard scoring run. He turned football games into track meets, as the Bearcats’ offense outscored opponents 294-35 his senior year. It’s important to note what happened when Thomas didn’t step on the field at 100 percent. He was slowed by a muscle strain in the district semifinals, and William Penn suffered its only loss of the season, falling 15-12 to J.P. McCaskey in a district semifinal. He played in the Big 33 and chose to accept a football scholarship from Penn State after receiving offers from North Carolina, Syracuse and Rutgers — among others. Chronic knee injuries at Penn State cut his career short. Barb DeShields (Class of 1990): She is perhaps the best girls’ basketball player in league history. She did things no girl or boy had done before. Few have been able to match her honors since. Listed as a 5-foot-9 center, she played all five positions. She was the first league player (boy or girl) to score 1,000 points as a sophomore, and the first league player (boy or girl) to score 2,000 points. When she graduated, she led all league players with 2,175 points. She led the league in scoring as a sophomore and junior by averaging identical 23.5 points per game averages. She also led the league in scoring as a senior. She scored a single-game school- and league-record 52 points against Hanover. As a team, the Bearcats went 5-9 in league play before DeShields arrived. DeShields’ Bearcats went a combined 51-4 in four years of league play, winning three division titles and two league championships. She played two seasons at Division I Fairleigh Dickinson. After college, a heart condition prevented her from trying out for the WNBA. Omar Brown (Class of 1993): He earned Coaches Player of the Year honors and YDR Offensive Player of the Year honors in football. He stood out for his defense in basketball, playing a pivotal role on the Class AAAA state semifinal team in 1992. William Penn needed Brown to pick up the tempo so the undersized Bearcats could run against taller teams. On the track, he placed second to teammate Emne’ko Sweeney in the 200 at the league meet and placed sixth in the district in the 100. He was a member of the 400-meter relay team that won league and district titles and placed fourth in the state. Penn State and Maryland offered him football scholarships, but he accepted a scholarship to the University of North Carolina. Eventually drafted by the Atlanta Falcons, he played in the NFL. Emne’ko Sweeney (Class of 1993): He won league titles in each of his three sports. He played running back and safety in football for the 1992 team that shared the Division I title with South Western and Central. His rushing numbers (676 yards) weren’t astounding, unless it was taken into account that he split time with teammate Omar Brown and still averaged 8.5 yards per carry. A pivotal player on back-to-back league title teams in basketball, he led one of William Penn’s best teams in 1992. The Bearcats lost to perennial power and eventual state champion Steel-High in the district final and state semifinals during his junior year. He served as co-captain and scored 14 points per game his senior year. He won the league’s 200-meter title in track and ran on the 400-meter relay team that won league and district titles and placed fourth in the state. He attended Fork Union Academy before becoming one of the best running backs in school history at Kutztown University.